Flex Passes for both the Racine Theatre Guild mainstage shows and the Racine Children’s Theatre are no longer available for the 2018 – 2019 season. 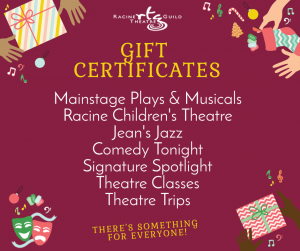 Gift Certificates can be purchased in any amount and used for all of the productions and activities offered at the Racine Theatre Guild. They make a great gift for people who like a little bit of everything! Call the Racine Theatre Guild at (262) 633-4218, or visit the Box Office, Monday – Friday, 12 – 6 p.m. for the perfect theatre gift! Note: RTG will be closed December 24 – 26, 2018.